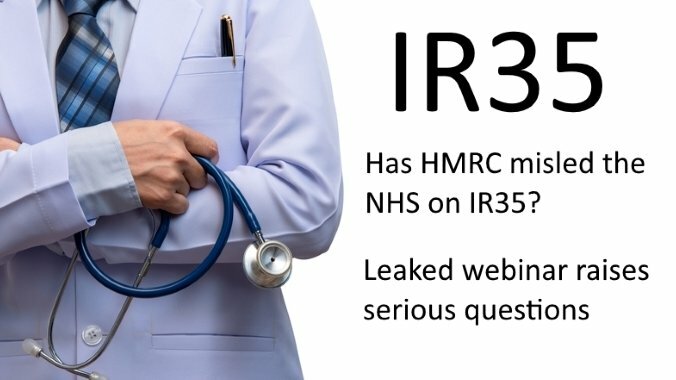 Tax experts and lawyers have called into question HMRC’s grasp of the laws surrounding IR35 and expressed fear that the taxman has misled the public sector on implementing the Off-Payroll legislation, following the exposure of a controversial webinar delivered to the NHS. “The consequence of this guidance to NHS Trusts has already resulted in a reduction in locums prepared to work in hospitals, leading to rota gaps not being filled, and a worsening of the winter crisis and endangering patient care,” adds IHPA secretary-general, Dr Iain Campbell. Is HMRC inciting blanket IR35 assessments? “Frampton is wrong here, and this is a dangerous statement, both for locums and the NHS itself,” says Valentine, who warns that HMRC’s guidance could be misconstrued by NHS Trusts as a licence to apply the rules on a uniform basis, forcing many genuine contractors to shun working for the NHS, or else risk suffering a considerable reduction in income. Frampton instructed Trustees that their locums would routinely find themselves subject to the right of supervision, direction or control, encouraging them to ignore arguments raised by contractors that sufficient control does not apply to their engagement. “Mistaking a clinician’s obligation to comply with statutory standards for the existence of a right of control in employment law is a basic error that HMRC has shown itself to be prone to in recent years,” continues Valentine, speaking with reference to a recent high-profile tribunal cases involving HMRC and the Professional Game Match Officials Ltd (PGMOL). Just last month, it emerged that PGMOL had defeated HMRC in court after the taxman had incorrectly challenged the self-employed status of PGMOL’s referees. The tribunal agreed that the regulatory control to which referees were subject didn’t constitute there being a contract of service in place, as HMRC had erroneously claimed. “It’s little wonder that HMRC has lost 90% of employment tribunal cases over the past decade when you consider that it is still unable to grasp some of the fundamental aspects of case law,” adds ContractorCalculator CEO, Dave Chaplin. During the webinar, NHS Trustees were advised that, in order to pass the IR35 substitution test, a contractor would need to have an assistant, should they be unable to complete the work themselves. Frampton attempted to vindicate this claim by alluding to the ‘Ready Mixed Concrete’ employment status case, wherein a number of workers who had used substitutes were found to be self-employed. “HMRC has clearly only glossed over the Ready Mixed Concrete case, which is largely concerned with the right of control, not whether a substitution has been exercised,” explains Valentine. “As such, this statement fails to reflect case law accurately and is potentially misleading. The same flawed HMRC interpretation of mutuality of obligation (MOO) that has been chastised by experts and rejected by IR35 Forum members was relayed to Trustees, reiterating the taxman’s insistence that exchanging labour for payment constitutes its presence. “If an employment status lawyer were to provide similar advice to this on MOO and cause him/her client to suffer loss, they could be considered negligent,” notes Valentine, who highlights HMRC’s failure to distinguish between contractual MOO and employment MOO. What is to blame for HMRC’s questionable IR35 guidance? Chaplin believes that the taxman’s failures warrant serious attention from within Government’s ranks: “The complexity of some of the issues HMRC has to tackle means that, where mistakes are made, it can unwittingly result in victimising innocent taxpayers. Lesley comments: “In my experience assisting with IR35 Reviews I'm increasingly concerned about HMRC Officer’s possibly being given powers beyond their ability, and there should be consistent checks and balances in place to ensure guidance given out is not misleading and/or inaccurate. “Rather than collecting the right amount of tax, HMRC’s approach appears to be geared toward collecting as much tax as possible. During my 14-year career at HMRC, I witnessed this first hand through regimes such as Accelerated Payment Notices. And since leaving the Revenue my experiences helping those affected by the retrospective 2019 loan charge leads me to believe HMRC have little regard to tax payers.